With the comics, Hrithik will share "important lessons that will help them grow into compassionate human beings"
Hrithik Roshan's innovative ways to impart moral values to his sons Hrehaan and Hridhaan may give 'Dad Goals'... no, make that 'Super-dad Goals.' 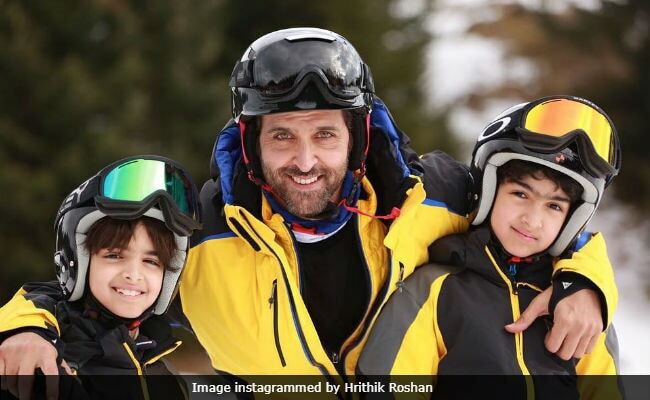 After sharing a poetic verse on Hrehaan's 13th birthday last month, the Krrish star is reportedly designing comic books for his sons. A mid-day report stated that Hrithik writes the content and makes the doodles for the said comic books. Hrithik's spokesperson confirmed it. "Hrithik believes in mental stimulation for his children, so he has been creating comic strips and penning stories for his kids. He wants to give out important lessons that will help them grow into compassionate human beings. The stories are told in the format of comic strips and Hrithik designs the doodles himself," a source told mid-day. "He spends time on these stories alone first. Once he has given form to the story by way of doodles, he shares them with his kids," the source said adding that Hrithik does not intend to publish these comics as "it's meant only for his sons." Hrithik Roshan's verse (which he shared on Hrehaan's birthday) was titled Darr Se Mat Darr. and Hrithik's colleagues such as Abhishek Bachchan, Vivek Oberoi and Varun Dhawan were also quite impressed with it. Hrithik Roshan is currently filming Super 30, based on the life of mathematician Anand Kumar's Super 30 programme, in which Mr Kumar coaches 30 candidates from economically backward sections each year for the entrance examination for Indian Institute of Technology. Super 30 is directed by Vikas Bahl.